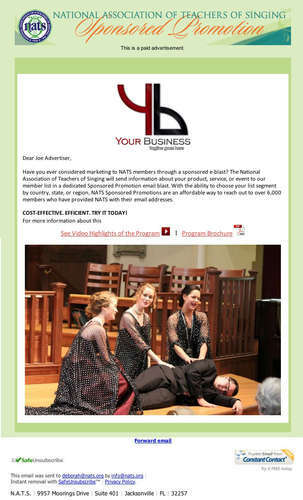 The National Association of Teachers of Singing will send a paid advertising message about your product, service, or event to our member list in a dedicated Sponsored Promotion e-mail blast. With the ability to choose your list segment by country, state, or region, NATS Sponsored Promotions are an affordable way to reach out to more than 7,000 members who have provided NATS with their email addresses. 50% off repeat orders: If you wish to schedule a second or third Sponsored Promotion (with the same content to the same recipients), you may do so at half the price of your first order AND have the opportunity to change the subject line. This is great for reminder emails as your event date or promotion deadline approaches! Text of the Subject field for your Sponsored Promotion (maximum of 50 alphanumeric characters). Optional: Graphic display ad, which will be primary content of the email, in JPG format (maximum of 585 pixels wide). You may also supply a PDF file of the correct dimensions, and we will convert it to a JPG for you. Optional: URL to which you would like your graphic to link when a reader clicks on your Sponsored Promotion (e.g., http://www.yoursitename.com). We recommend that your graphic include a call-to-action such as “Click here for more information” to drive traffic to your site. Optional: Body text of the email. If you wish to link specific portions of text to the web, please provide basic HTML code. Full payment is required for orders that you cancel after they are mailed out. Please be aware that some email addresses may be incorrect if members have not updated their contact information with NATS. While we are not able to guarantee open and click-through rates, we are happy to provide you with these statistics upon request. To get a specific quote for your targeted list, please call Tina Hooks at 904-992-9101 or email us at info@nats.org.